Happy National Bird Feeding Month! February marks National Bird Feeding Month. For all of you bird enthusiasts, now is the perfect time for you to stock up on bird food and maybe even try out a new feeder. Sure, birds may be flying south for the winter, but with this unusually warm winter we are having, you may have a few feathered friends lingering in your yard. ProperPet.com carries quality feeders on our site for various wild bird species. They feature different shapes and designs, and are based on the sizes of birds, the amount of seed that can be held, etc. Also, have a look at the For the Wild Birds blog. There you’ll find loads of helpful information about different bird species, feeding tips and other valuable tips. Happy National Bird Feeding Month! 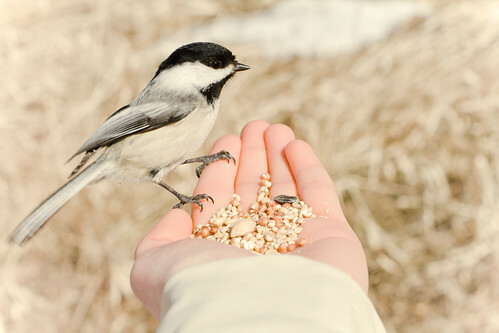 2 0	Permalink to: Happy National Bird Feeding Month! While we offer great lines of products for cats and dogs, we have not forgotten about our feathered-friends. We offer a range of products to keep your bird s happy and flapping their feathers. For your pet bird, a bird harness is the perfect buy to have him or her accompany you on a walk, while keeping them close by and safe. From petite to large, a variety of sizes are available to choose from. For those wild birds that like to stop by your backyard to take a rest from flight, we offer a selection of wild bird feeders and wild bird seed. A wild bird feeder gives them a place to land, take a load off and refuel with some yummy seed, before they continue on their flight. Some of the options include tube feeders, suet feeders and platform feeders. Fill those feeders with our selection of wild bird seed. Our selection includes bird seed mixes, blends and sunflower seeds to feed a variety of birds, including goldfinches, cardinals, woodpeckers and blue jays. Keep those feather-friends flapping and in flight with these great products! Copyright 2019 ProperPet.com, LLC. All Rights Reserved.